I'm not sure what ink I need for the MUFC printer? For the Epson MUFC Limited Edition printer, any of the cartridges listed on this page are compatible. The original Epson MUFC ink cartridges (Daisy packaging) are available in two different capacities for each colour with standard (Epson 18 cartridges) or high capacity (Epson 18XL cartridges) depending on how much ink you use. Our compatible MUFC printer cartridges are only available in the high capacity size. As long as you have a cartridge installed in the four separate colour slots for black, cyan, magenta and yellow you can use any mixture of standard and high capacity ink or genuine and compatible inks within the Epson MUFC Limited Edition inkjet printer. The small footprint, design, and wireless capability are the main features that make the Epson MUFC Limited Edition attractive for home users, as well as to fans of the football team. It supports email and mobile printing, while copy and scan functions make it more reliable and versatile for home use, though it is not recommended for use in the office that needs a faster and more robust multifunction machine. It weighs only 4.1kg and the sleek, stylish body measures 390mm wide, 145mm tall, and 300mm deep. 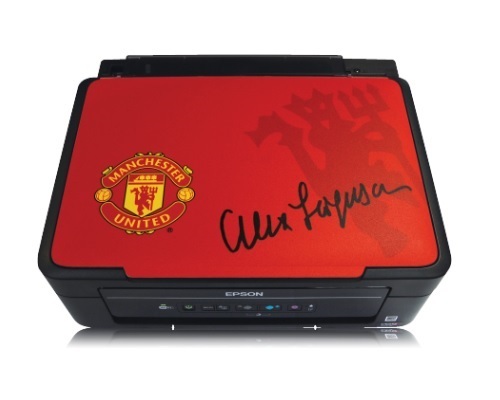 The most distinctive feature of the Epson MUFC Limited Edition is the Manchester United design on the flatbed scanner's lid, with the digital signature of Sir Alex Ferguson. Epson engineered the engine to work with its signature Micro Piezo print heads and variable-sized droplet technology. The 100-sheet standard tray can handle 20 photo sheets at a time. It is compact and lightweight to save space, while all-in-one features streamlines tasks in a single user-friendly device. It is easy to set up the wireless connection, and it is Apple AirPrint ready. Epson Connect makes it easy to print from tablets and smartphones. The Epson MUFC Limited Edition works with Epson Connect for mobile printing over email and Wi-Fi. Claria Home inks work well with the 5760x1440dpi print engine to produce glossy photos and sharp text. The Epson MUFC Limited Edition comes with a Manchester United Print Studio PC CDRom, which enables users to print their own MUFC branded posters, flyers, calendars, invitations, door hangers, greeting cards, and more. The Epson MUFC Limited Edition is slow. Its speeds are quoted at 6.2ppm in monochrome and 3.1ppm in colour, based on ISO/IEC 24734 standard. Duplexing is manual. The paper capacity of the Epson MUFC Limited Edition is not expandable.